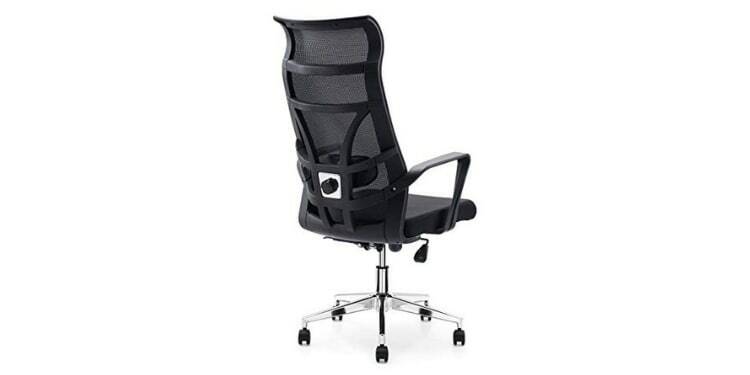 On the hunt for the most comfortable and supportive chair to use for working or gaming? 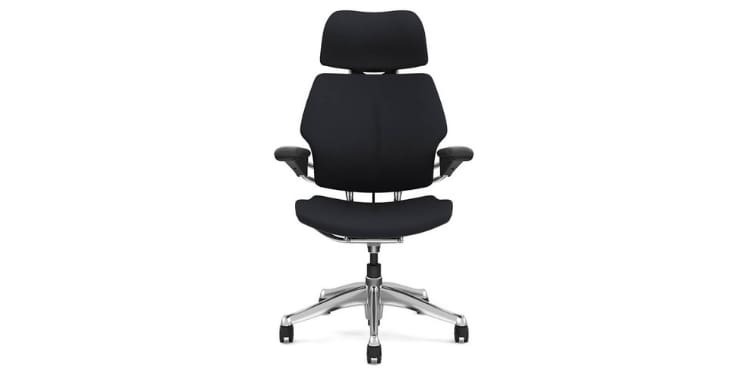 Our reviews should help to find the best ergonomic office chair! Having a comfortable place to sit is a make or break matter when it comes to how good or terrible your gaming or working setup is. If you’re uncomfortable while working or gaming your efficiency or enjoyment will be severely hampered, and this is even more true for those who have back pain or other back issues. Knowing this, we set out to help people find the best ergonomic office chair on the market to help them game and work comfortably. Below you’ll find our reviews for the top ten ergonomic office chairs on the market along with a short guide that will help give you the information you need to make an informed decision as to which of the chairs on our list might be right for you. While on the hunt for comfortable chairs, Herman Miller is a name you’ll come across a lot. The company was founded over a hundred years ago in Michigan and became renowned in the 60’s and 70’s for making some of the greatest and most iconic pieces of modernist furniture to date. Today, they offer a wide line of office furniture, which is befitting of the company credited with inventing the cubicle. 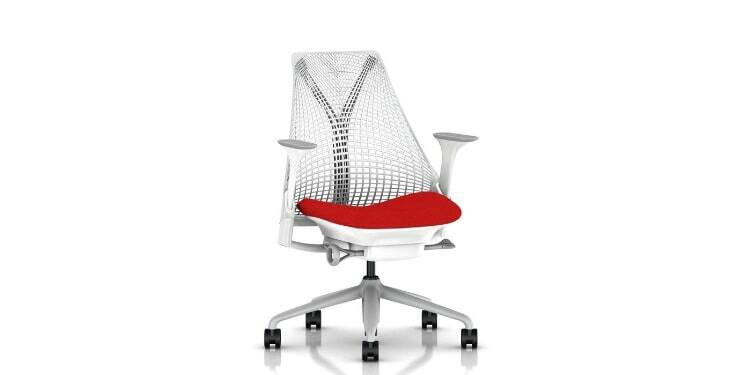 The first of the Herman Miller chairs on our list takes the number one spot overall and is the best computer chair for long hours thanks to its incredibly comfortable and supportive design. The back of the chair is constructed of a mesh supported by a series of adjustable arms. These arms can be adjusted to fit your back and body and can offer a very ergonomic and comfortable place to work or relax. That being said, this is also one of the main drawbacks of this chair. The number of points of adjustment can be a bit of a hassle and getting it just right is pretty important to getting the most out of this chair. The other main thing that will push people away from this one is the price. Herman Miller produces some amazing products, but this particular chair’s price tag is definitely going to push some buyers away. Moving back to the good things though, the chair comes in a huge variety of colors ranging from predictable blacks to vibrant greens and blues. There are also two types of fabric available, a slightly coarser but more breathable option called “balance fabric” and a softer option called “rhythm fabric”. Interestingly enough, like Herman Miller, Steelcase is a furniture company that has been around for over a hundred years and is based out of Michigan. Their Gesture chair is one of the most thoroughly designed and versatile chairs on the market. The Gesture is designed to be not only comfortable but also user-friendly and adaptive to a wide variety of uses and people. And yeah, we know, this sounds like bubbly marketing language, but it’s more than that since it is kind of true. Let’s start by looking at the adjustment controls. We’ve all had the experience of sitting in an office chair and having no idea how to adjust it or what all the knobs and levers do. This chair has two easy to use knobs that turn to adjust seat height, depth, tension, and the variable backstop. This makes the chair super easy to use and adjust to the most comfortable setup for you. 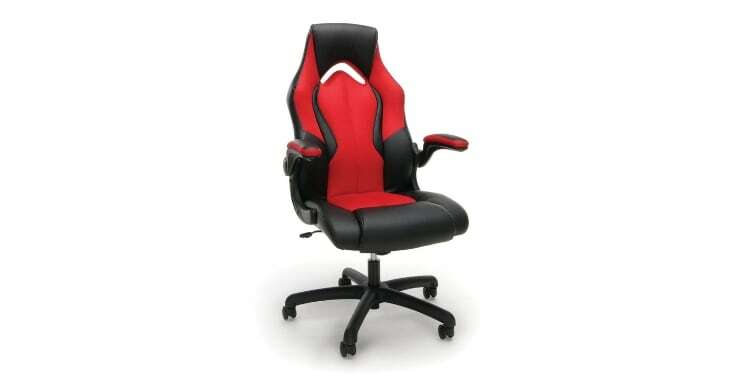 Additionally, the chair features unique adaptive bolstering that uses air pockets under the foam cushion of the seat to offer more consistent support and comfort. Even more impressively, The core equalizer backing of the chair allows it to offer more lumbar support when upright and less when leaning back, making it comfortable in any position. Also, the arms can adjust in any direction, ensuring the chair offers a good fit for you. The only real drawback to this chair is that the lumbar support cannot be adjusted. It’s in a good place though. Otherwise, the chair looks amazing and modern and functions equally well making it the best office chair for those who want a highly versatile chair. Many of the best computer chairs on the market today feature more aggressive styling and a more eye-catching design. If you’re looking for a chair that can offer an incredibly comfortable place to sit but won’t be the most attention-grabbing thing in the room, then the Steelcase Leap is a great option. This chair sports a much more traditional design with a pretty standard office look to it. That being said it can be given somewhat of a personal flair thanks to the huge assortment of colors available. Don’t be fooled by this chair’s unassuming looks though, it is incredibly comfortable and impressively adjustable. The backing of the chair has an adjustment tab on either side that you can move to adjust the lumbar support up and down while under the seat is a small knob for adjusting the firmness of the back support. Finally, another, larger knob under the seat can lean the chair more or less upright. With these points of adjustment, the Steelcase Leap actually offers a much more comfortable seat than its simple looks would let on. With all that said, this chair is definitely not for everyone. It is very supportive and uses very firm padding, which some people like while others don’t. If you’re looking for a simple chair that offers excellent and firm support then this might be the one for you. If you prefer softer cushioning or a more aggressive style, then maybe not. One thing you may have noticed when shopping for the best ergonomic chair is that most of them require you to carefully adjust them to your posture and body in order for them to be as comfortable as possible. One designer, Niels Diffrient, set out to change this trend when he designed the Humanscale Freedom. This unique ergonomic office chair is designed to move around you and with you as you move rather than needing to be constantly adjusted for every new posture you find yourself in throughout the day. The armrests are attached to the back of the chair rather than the seat so they can move with you as you recline. Additionally, the headrest and seat both pivot and move as they recline to offer you proper support and comfort in any position. The very tall headrest lends to the overall supportive design of the chair and is one of the handfuls of parts that you can adjust. In addition to the headrest, the seat height and armrest heights can also be easily adjusted if needed. Many people, however, complain that there is not quite enough cushioning in the chair for them. The headrest, back, and seat are all very thinly padded with firm padding that offers support for those who need it, but might not be the most comfortable for more sensitive people. If you live in a warmer climate or are just someone who is generally warm, then having a mesh chair might be a great option for keeping cool. Mesh chairs are much more breathable than standard fabric chairs and offer better airflow to your back and bottom which helps keep you cool and comfortable. 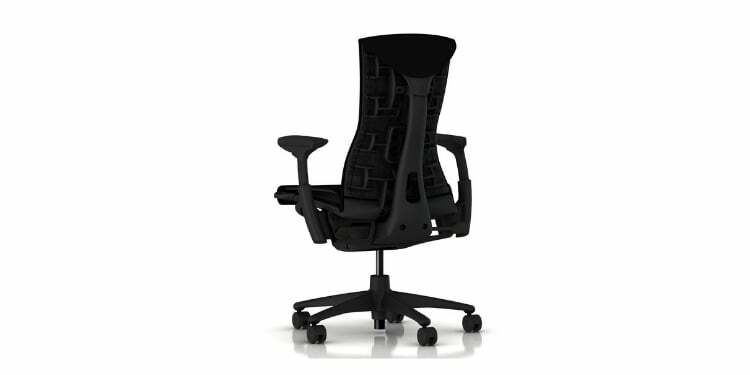 The Balt Butterfly is one such chair with a mesh back, headrest, and seat for maximum cooling. On top of improved breathability, mesh also offers a nice supportive feel that a lot of people prefer over fabric and cushions. The taught mesh stretches to accommodate you more naturally in many cases than fabric and cushions can. The Balt Butterfly uses quite the opposite design philosophy of the Humanscale Freedom we just looked at and relies on tons of points of adjustment to offer a comfortable and ergonomic experience. While this does take some time to set up and can be a bit of a hassle, once you get it dialed in this is arguably the best chair for posture on our list thanks to its comfortable and adjustable lumbar and head support. The armrests are also highly adjustable on this chair, able to move up and down to stay out of the way of desks. Even the angle of the seat itself can be adjusted on this chair which means it can offer you an incredibly personalized and custom seat designed just for your body and posture. The Herman Miller Sayl is by far the sleekest and most modern looking chair on our list. It features a design by Yves Behar who drew inspiration from the Golden Gate bridge for the design of this chair. Pretty lofty stuff, but the result is pretty great. This chair has a super cool looking back to it that leans back when you do and a nice soft and thick cushion on the seat. Under the chair are a number of knobs and levers that you can use to adjust all manner of things about the feel of the chair. For starters, the height of the chair can be adjusted, as can the amount of force that is needed to push the chair back into a more reclined position. You can also change how far back you can push the chair, or even keep the chair upright, with a lever on the left side of the chair. You can even change how far forward or back the seat itself is relative to the back and how much of an angle the seat is at. While this chair does sport some amazing aesthetics and is offered in tons of colors, it lacks any real lumbar support. The chair can be very ergonomic thanks to all of its adjustments and is very comfortable thanks to the thicker seat cushioning, but without lumbar support, it might not be the best for those with back pain or other issues. 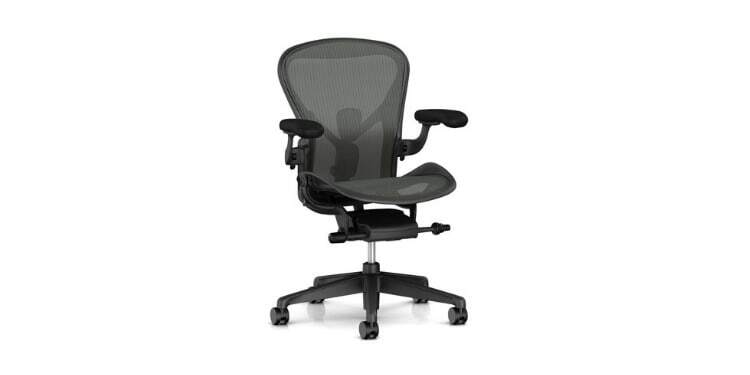 The final Herman Miller chair we’ll be looking at on our list is the Herman Miller Aeron. This chair is appropriately given a nice and airy name since the back and seat of the chair are made from a breathable mesh that is, well, breathable to help keep you cool while working or lounging. While this is a rather plain looking chair that would easily fit in with any office or home decor, it’s simplistic looks are somewhat deceiving. It’s clear that Herman Miller paid a lot of attention to detail and engineering. It has a distinct waterfall design to the front edge of the seat, which puts less pressure on your legs and thighs and makes sitting for long periods much more tolerable. 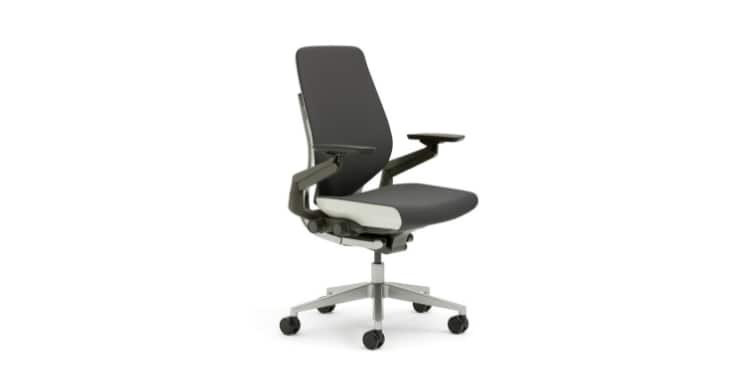 For the lumbar support, Herman Miller has used its adjustable Posturefit support which is designed to keep your back and hips in alignment making this the best office chair for back support in the mid-price range. The armrests are also very adjustable and can easily be moved inward or outward and up or down to fit under a desk. Finally, the chair also leans back and has an adjustment for how much force is required to do so. If you’re looking for a very unassuming chair that won’t be the focal point of the room like the Herman Miller Sayl then the Aeron is a great option. We’ve finally reached the point on our list where we’ve transitioned from more high-end products to the more affordable offerings on the market. If you’ve checked out some of the chairs we’ve talked about so far then you’ve probably immediately noticed that they’re all hundreds-- if not over a thousand dollars-- but the last three chairs we’re going to take a look at are much more budget friendly. The first of these is the Allguest computer chair. This chair looks great for the price and boasts a very modern look coming in either white or black. The backing is made from breathable fabric while the seat cushion is thick padding covered with fabric. Behind the mesh back is a very firm and supportive adjustable lumbar support. This is a particularly pronounced and firm lumbar support, making this the best office chair for back pain and discomfort. Unfortunately, aside from the lumbar support and seat height, this chair does not have much adjustability. The armrests are fixed in place and cannot even move out of the way if needed. However, the chair does lean back and can be locked upright. With the mesh back keeping you cool and the lumbar support helping your posture this chair is actually a great deal and would look great in any home or office with modern decoration. For those looking for a simple office chair that offers important ergonomic support while still carrying a lighter price tag, we suggest the Alera Elusion. This chair has a simple look to it with a mesh back and well-cushioned seat but has the adjustability and lumbar support of a chair well above its price. 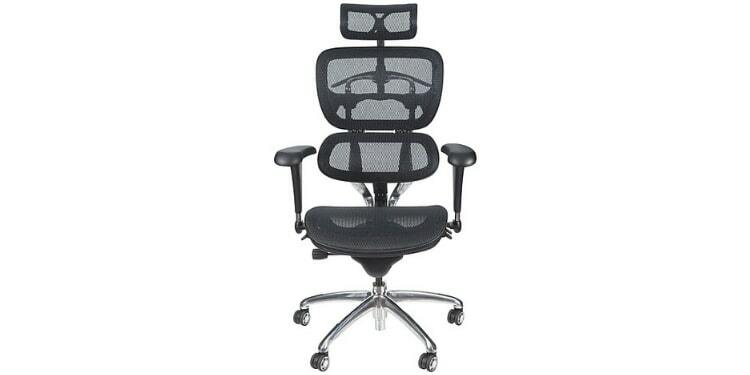 The mesh back of this chair acts as the lumbar support and does so quite well. The back can be adjusted up or down to help with this and the armrests can be adjusted up or down as well. This makes getting into your desk a breeze, and the armrests can also be adjusted inward and outward making this a great chair for office use by people of all sizes and postures. The front of the seat uses a waterfall cushion design to reduce the pressure put on your legs and offer better blood flow to your legs as well. While this certainly isn’t the best looking or even the most ergonomic chair on our list, it is still well worth the relatively low price tag for what it has to offer. Your chair is a place that you’ll be spending much of your time, perhaps eight or more hours a day. The average person is sitting now more than ever, which is why having a good chair is so important. Bad chairs can reinforce bad posture and even lead to back pain. This is the whole reason ergonomic chairs are a thing. People realized how much time we spend sitting and how much of a problem there was with back pain and discomfort from it and decided we needed better chairs. There are a few things to look for when shopping for ergonomic chairs, namely lumbar support, adjustability, and materials. The portion of the spine that begins to present most people with trouble and discomfort is the lower part of the back, or the lumbar spine. This curved portion of the spine is not supported as well by our muscles when seated and relaxed, so it can easily develop issues. To prevent this, good chairs offer excellent lumbar support to keep this portion of your spine protected and comfortable. The best chairs for people with lower back pain or back pain, in general, will be those that have an adjustable lumbar support, which takes us nicely into the next main point we want to touch on. The second most important thing that you want to consider when looking for an ergonomic chair is how adjustable it is. In most cases, the more adjustable a chair is the more it will be able to accommodate your distinct body shape and posture. 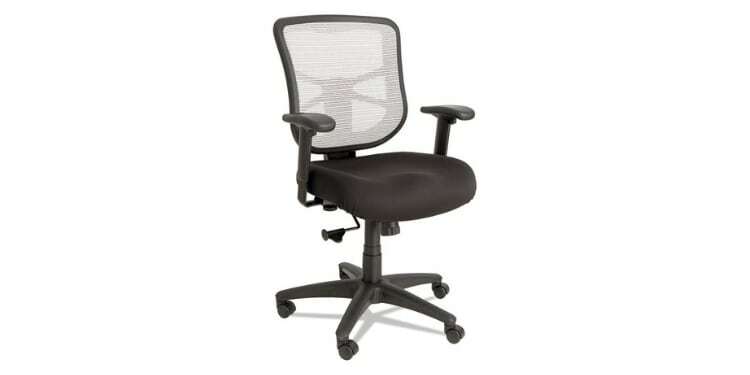 Many chairs have adjustable height, but fewer chairs will have things like, as we mentioned, adjustable lumbar support. Other things to look out for are adjustable headrests, adjustable armrests, and even adjustable seat angle (although this is pretty rare). The one instance in which more adjustment is not necessarily better is the Humanscale Freedom. This chair is designed for, and by, those who think constantly adjusting your chair is tiresome and want the chair to conform to them. The last thing to keep an eye on is the material that the chair is made of. 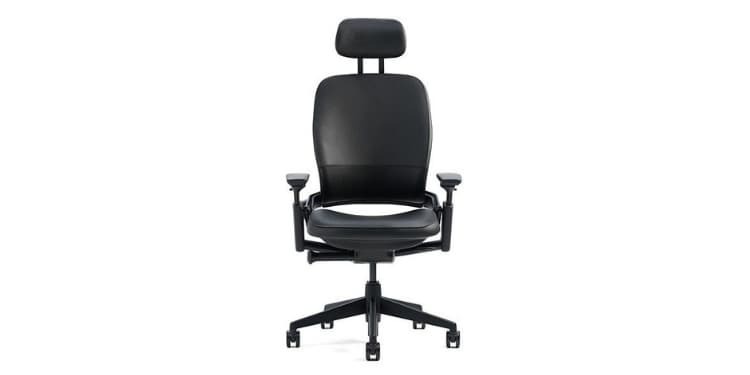 Office chairs are generally made of either fabric, mesh, or leather. This has more than just a cosmetic effect on the chair though, as this will also alter how the chair feels and how comfortable it will be. As you might expect, leather is not very breathable and can be a bit more uncomfortable in warmer climates or rooms. Similarly, fabric is not particularly breathable either, but it is generally softer than leather. When it comes to staying cool, mesh is king. Mesh is incredibly breathable, which helps keep you cool. Mesh can also stretch which helps support your weight more naturally. Leather is preferred by some for the looks, but is not nearly as cool and in some cases not as supportive as mesh.